Fujitsu today announced the availability of eXperience Data Platform (XDP), a solution that supports real-time marketing through data integration for each customer and a variety of consulting services, including those to help businesses formulate marketing strategies. XDP will initially roll out in Japan from November 4. 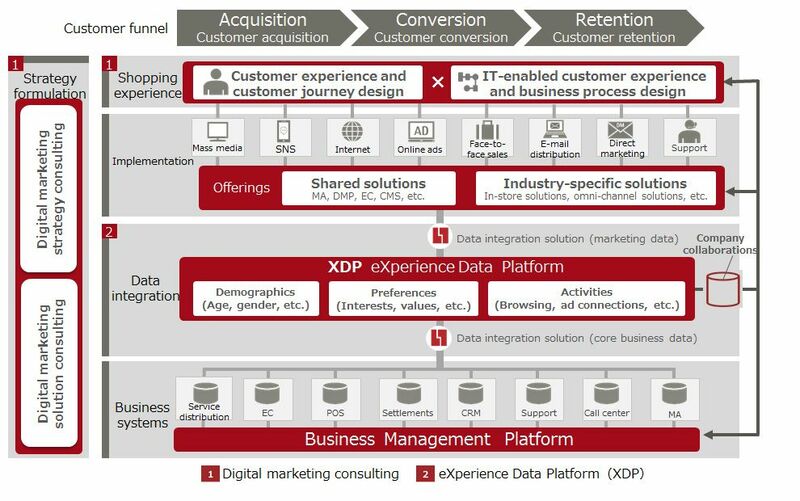 Fujitsu will offer consulting services and related solutions built around XDP, structured as FUJITSU Digital Marketing Platform CX360, to help businesses make the best approach to each individual customer, and contribute to helping companies become more competitive and transform their business operations. Integrating information about customers held both inside and outside the company for use in marketing activities requires establishing objective-based strategy formulation and benchmarks for implementing PDCA. Fujitsu's marketing consultants, trained in using data, help businesses develop more sophisticated digital marketing efforts, such as by formulating marketing strategies, setting KPIs, and implementing and optimizing the operating methods of their marketing solutions. Ordinarily, a customer-journey map, which shows a customer's set of buying habits as a time series, would be used to design the ideal customer point of contact, but the supporting operations or systems often lag behind, hindering further implementation. Fujitsu provides customer point of contact design that can be executed, covering everything from designing the customer experience to the supporting operations and systems. Customers can choose the consulting method that is best for them, depending on the availability of data for analysis and objectives, such as reviewing operating processes, improving practices, or designing marketing scenarios. For the customer journey, as well, Fujitsu has prepared three types of approaches, including issue improvement, setting goals, and analyzing customers. Digital marketing strategy consulting To deploy and use digital marketing, this clarifies a company's vision and the value it delivers, compares the current and desired customer points of contact using customer journeys, and creates marketing programs and mid- to long-term milestones. Businesses that are already using digital marketing are provided with assessment services to get a clearer picture of their current status and make improvements. Using different analytic methods, including big data analytics refined by Fujitsu, current trouble spots and points needing improvement are clarified, and support is provided in formulating marketing programs and setting KPIs. Digital marketing solution consulting Through marketing strategy formulation and assessments, Fujitsu provides consulting services for tool selection, deployment, and implementation and execution with clear marketing programs, including the deployment of marketing-automation tools, the utilization of data management platforms, and e-commerce site builds. 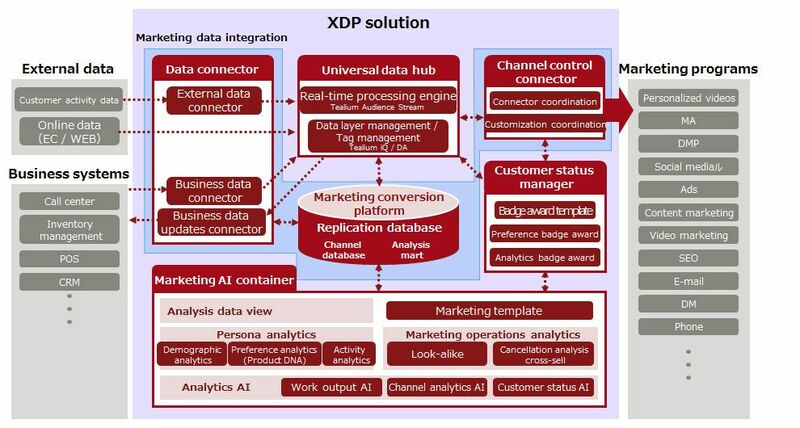 XDP makes it easy to integrate and connect business data and online data about customers, visualizing data, conducting diverse data analyses, and developing rules for the accumulated business intelligence in order to help produce the best approach to the customer in real time. XDP is a digital marketing solution that makes it possible to assemble the best components for each customer individually. Help for deploying and putting digital marketing to use is provided with a range of options, including data connectors to realize customer-centric data integration, universal data hubs, marketing convergence platforms and other essential components, as well as marketing AI containers that use AI technology, and templates that aggregate expertise. XDP can be deployed one component at a time. This lets businesses make the most of their existing resources, while deploying only those components they need for customer-centric marketing, so that they can build their platform more quickly. Fujitsu provides one stop support for using XDP, including everything from planning and operating data-integration platforms to executing programs. Supporting teams are comprised of data engineers with the know-how to plan, build, and operate data-integration platforms developed across a range of industries, such as transportation, retail, automotive and energy, data curators who are analysis specialists and marketing consultants trained in handling data. Marketing data integration Provides support services for planning, designing, building, and operating data-connection functions (data connectors, channel control connectors) that connect marketing tools with various internal and external systems, and the marketing conversion platform that integrates their data. Fujitsu's data engineers use dozens of cloud design patterns and agile project-management methods for collecting, processing, and storing data, in order to build platforms more quickly. After the platform has been built, Fujitsu supports business operations to enable marketing strategy formulation and program implementation. Universal data hub The data hub can centralize massive, disparate collections of customer data, and tie together various marketing tools at the individual customer level in real time. Such real time processing engines and tag management are used for Tealium iQ of Tealium in the US, and also Audience Stream. With support for more than one thousand kinds of marketing tags that can execute services and marketing tools embedded in web pages, this helps centrally manage customer information that had been fragmented across different marketing tools and business systems. Marketing AI container A marketing-analysis platform using the analysis know-how and knowledge of Fujitsu's data curators, along with AI technology. This platform includes big-data analysis functions and AI functions that can adapt to the different kinds of data and objectives that each company will have, Hadoop to support large-scale distributed data processing, more than 700 kinds of analysis tools, including statistical and machine learning, and open-source software that includes AI. In addition, using the Docker(1) virtual technology and offering the platform as a whole eliminates dependence on running in a public cloud, a private cloud, or on premise system, which will speed availability. Customer status manager This solution manages analyses results not only from the Universal data hub, which processes data on the behavior of individual customers in real time, it also tracks the preferences and status of customers gleaned from analyzing business and external data using the Marketing AI container. Fujitsu may also make this available on a SaaS basis in the future. Marketing template Building on the company's accounting-review know-how developed through deploying Business Management Platform, Fujitsu offers an extensive range of more than 100 types of marketing templates, which make it easy to visualize data stored in XDP, and can be used for KPI management. After deploying these templates, users are able to customize them with intuitive operations. By changing the KPIs being tracked and how they are displayed to adapt to changing circumstances, businesses can adapt to their changing business environments and maximize their marketing ROI.